Audrey J. Weiss, Ph.D., Molly K. Bailey, Lauren O'Malley, Marguerite L. Barrett, M.S., Anne Elixhauser, Ph.D., and Claudia A. Steiner, M.D., M.P.H. This HCUP Statistical Brief presents data from HCUP Fast Stats on the rates of opioid-related hospital inpatient stays and ED visits by patient location (urban/rural) and community-level income from 2005 to 2014.3 The location and income groups with the highest opioid-related inpatient rates are presented for each of 44 States and the District of Columbia that provided inpatient data in 2014. The location and income groups with the highest opioid-related ED visit rates are presented for each of 30 States that provided ED visit data in 2014. States are ranked overall on the rates of opioid-related inpatient stays and ED visits by location and income group in 2014. Identification of opioid-related stays and visits is based on all-listed diagnoses and includes events associated with prescription opioids or illicit opioids such as heroin. Rates are calculated using the population denominator specific to each location or income group. 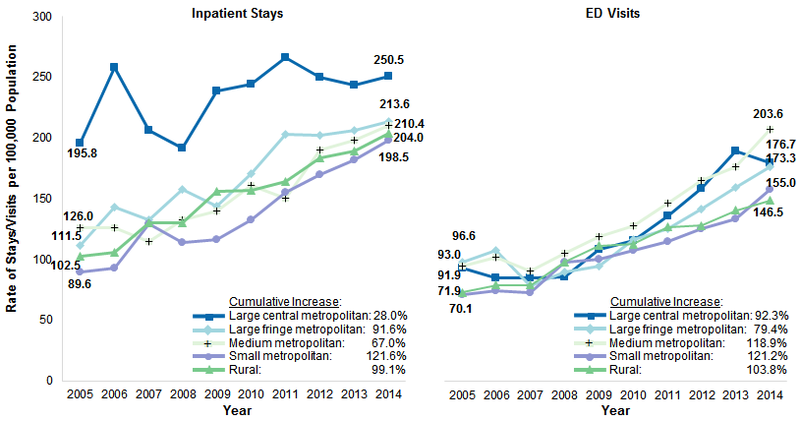 Figure 1 presents 10-year trends in the national rate of opioid-related inpatient stays and ED visits by location of patients' residence, from 2005 to 2014. From 2005 to 2014 in the United States, large central metropolitan areas had the highest rate of opioid-related inpatient stays. However, the rate of opioid hospitalizations increased the most in small metropolitan areas—a 122 percent increase versus a 28 percent increase in large central metropolitan areas. The rate of opioid-related emergency department (ED) visits increased less in large metropolitan areas than in medium metropolitan, small metropolitan, and rural areas. In 2014, the rates of opioid-related inpatient stays and ED visits were highest in urban areas for some States and in rural areas for other States. Among States with the highest rates in large central metropolitan areas, opioid-related inpatient stays and ED visits averaged 446.5 and 377.1 per 100,000 population, respectively. Among States with the highest rates in rural areas, opioid-related inpatient stays and ED visits averaged 215.4 and 177.3 per 100,000 population, respectively. For most States in 2014, the highest rates of opioid-related inpatient stays and ED visits were among patients residing in the communities with the lowest income. Two line graphs that show the rate of inpatient stays and emergency department visits per 100,000 population from 2005 to 2014 by patient location. Inpatient stays: Large central metropolitan: Increased from 195.8 in 2005 to 257.8 in 2006, decreased to 192.0 in 2008, steady increase to 266.0 in 2011, steady decrease to 243.9 in 2013, increase to 250.5 in 2014-28.0% cumulative increase. Large fringe metropolitan: Increased from 111.5 in 2005 to 142.8 in 2006, small fluctuations between 132.4 in 2007 and 143.5 in 2009, increased steadily to 213.6 in 2014-91.6% cumulative increase. Medium metropolitan: Increased from 126.0 in 2005 in to 126.2 in 2006, decreased to 114.7 in 2007, increased steadily to 160.9 in 2010, decreased to 150.5 in 2011, increased steadily to 210.4 in 2014-67.0% cumulative increase. Small metropolitan: Increased from 89.6 in 2005 to 129.2 in 2007, decreased to 113.8 in 2008, increased steadily to 198.5 in 2014-121.6% cumulative increase. Rural: Increased steadily from 102.5 in 2005 to 204.0 in 2014-99.1% cumulative increase. Emergency department visits: Large central metropolitan: Decreased from 91.9 in 2005 to 83.7 in 2006, increased steadily to 186.5 in 2013, decreased to 176.7 in 2014-92.3% cumulative increase. Large fringe metropolitan: Increased from 96.6 in 2005 to 106.2 in 2006, decreased to 77.6 in 2007, increased steadily to 173.3 in 2014-79.4% cumulative increase. Medium metropolitan: Increased from 93.0 in 2005 to 100.5 in 2006, decreased to 89.5 in 2007, increased steadily to 203.6 in 2014-cumulative increase 118.9%. Small metropolitan: Small fluctuations between 70.1 in 2005 and 71.9 in 2007, increased steadily to 155.0 in 2014-121.2% cumulative increase. Rural: Increased steadily from 71.9 in 2005 to 146.5 in 2014-103.8% cumulative increase. From 2005 to 2014, the rate of opioid-related inpatient stays increased the most in small metropolitan areas and the least in large central metropolitan areas. The rate of opioid-related inpatient stays was consistently highest among those residing in large central metropolitan areas from 2005 to 2014. However, over this time period, the rate increased the least in large central metropolitan areas (28 percent) and increased the most in small metropolitan areas—a 122 percent increase, more than doubling in 10 years. The rate of opioid-related ED visits increased the most in small and medium metropolitan areas and the least in large fringe metropolitan areas. The rate of opioid-related ED visits from 2005 to 2014 was generally highest among patients residing in large and medium metropolitan areas and lowest among patients residing in small metropolitan and rural areas. However, similar to the trend in inpatient stays, the ED visit rate increased the most in small and medium metropolitan areas (121 and 119 percent, respectively), followed by rural areas (104 percent). The rate increased the least in large fringe metropolitan areas (suburbs, 79 percent), followed by large central metropolitan areas (92 percent). Opioid-related ED visits increased at a faster rate than did opioid-related inpatient stays in large central and medium metropolitan areas but increased at a slower rate in large fringe metropolitan areas. Opioid-related inpatient and ED visit rates increased at a similar pace in small metropolitan and rural areas. 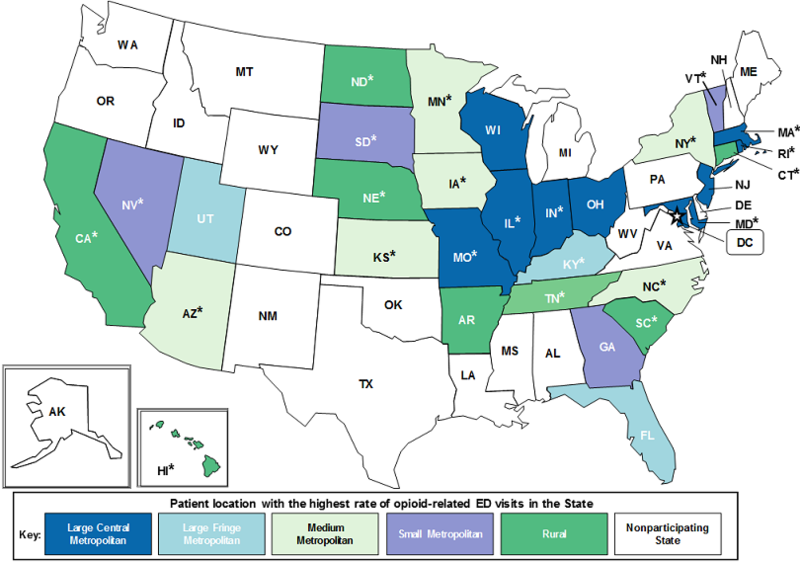 Figures 2 and 3 show the patient location within each State with the highest population rate of opioid-related inpatient stays (Figure 2) and ED visits (Figure 3) in 2014. The location with the highest rate overall is reported for each State. States where the difference between the highest and second highest rates was 10 percent or greater are noted with an asterisk. Figure 2 reports the patient location with the highest population rate of opioid-related inpatient stays for each of 44 States and the District of Columbia that provided data in 2014. Details on inpatient rates specific to patient location are shown in Appendix A. Note: Asterisks denote States where the difference between the highest and second highest rates in the State was at least 10 percent. a Opioid-related inpatient rates are per 100,000 population. 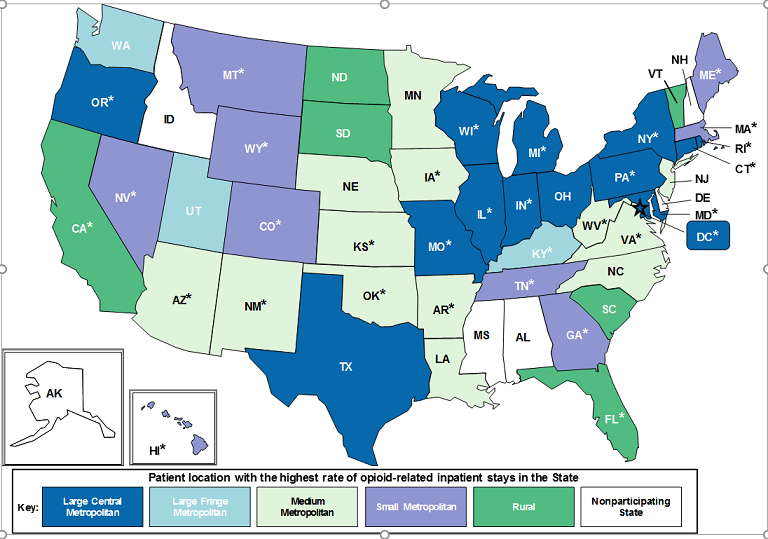 State-level inpatient rates by patient location are provided in Appendix A.
Map of the United States that shows for each state the patient location with the highest rate of opioid-related inpatient stays in 2014. Large central metropolitan: Oregon, Texas, Missouri, Illinois, Wisconsin, Indiana, Michigan, Ohio, Pennsylvania, New York, Rhode Island, Connecticut, Maryland, District of Columbia. Large fringe metropolitan: Washington, Utah, Kentucky. Medium metropolitan: Arizona, New Mexico, Nebraska, Kansas, Oklahoma, Louisiana, Arkansas, Iowa, Minnesota, West Virginia, Virginia, North Carolina, New Jersey. Small metropolitan: Nevada, Montana, Wyoming, Colorado, Tennessee, Georgia, Massachusetts, Maine, Hawaii. Rural: California, North Dakota, South Dakota, South Carolina, Florida, Vermont. Across States, there was substantial variation in the patient location that had the highest opioid-related inpatient rate in 2014. Figure 3 reports the patient location with the highest population rate of opioid-related ED visits for each of 30 States that provided data in 2014. Details on ED visit rates specific to patient location are shown in Appendix B.
a Opioid-related ED visit rates are per 100,000 population. State-level ED visit rates by patient location are provided in Appendix B.
Map of the United States that shows for each state the patient location with the highest rate of opioid-related emergency department visits in 2014. Large central metropolitan: Missouri, Wisconsin, Illinois, Indiana, Ohio, Massachusetts, Rhode Island, New Jersey, Maryland. Large fringe metropolitan: Utah, Kentucky, Florida. Medium metropolitan: Arizona, Kansas, Minnesota, Iowa, New York, North Carolina. Small metropolitan: Nevada, South Dakota, Georgia, Vermont. Rural: California, North Dakota, Nebraska, Arkansas, Tennessee, South Carolina, Connecticut, Hawaii. Across States, there was substantial variation in the patient location that had the highest opioid-related ED visit rate in 2014. 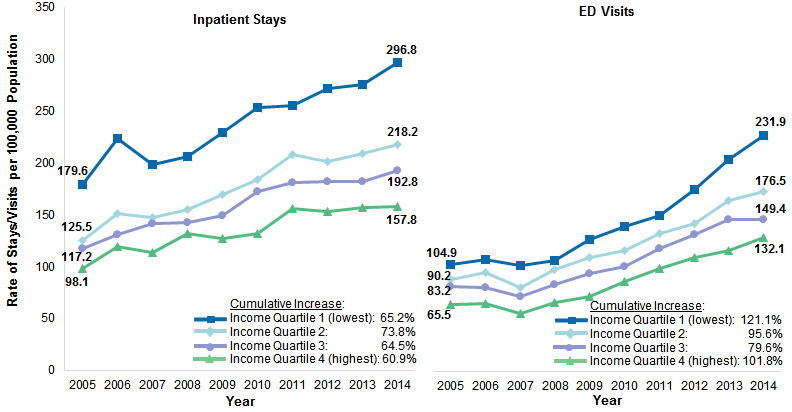 Figure 4 presents 10-year trends in the national rate of opioid-related inpatient stays and ED visits by median community-level income group, from 2005 to 2014. Two line graphs that show the rate of inpatient stays and emergency department visits per 100,000 population from 2005 to 2014 by community-level income. Inpatient stays: Income quartile 1(lowest): increased from 179.6 in 2005 to 223.8 in 2007, decreased to 198.4 in 2007, then increased steadily to 296.8 in 2014-65.2% cumulative increase. Income quartile 2: Increased from 125.5 in 2005 to 150.8 in 2006, decreased to 147.6 in 2007, increased steadily to 207.7 in 2011, small fluctuations between 201.4 in 2012 and 218.2 in 2014-73.8% cumulative increase. Income quartile 3: Increased steadily from 117.2 in 2005 to 192.8 in 2014-64.5% cumulative increase. Income quartile 4 (highest): Increased from 98.1 in 2005 to 119.0 in 2006, decreased to 113.8 in 2007, small fluctuations between 131.6 in 2008 and 132.2 in 2010, small fluctuations between 156.3 in 2011 and 157.8 in 2014-60.9% cumulative increase. Emergency department visits: income quartile 1 (lowest): Small fluctuations between 104.9 in 2005 and 109.0 in 2008, increased steadily from 130.1 in 2009 to 231.9 in 2014-121.1% cumulative increase. Income quartile 2: Increased from 90.2 in 2005 to 96.8 in 2006, decreased to 82.8 in 2007, increased steadily to 176.5 in 2014-95.6% cumulative increase. Income quartile 3: decreased steadily from 83.2 in 2005 to 73.7 in 2007, increased steadily to 149.9 in 2014-79.6% cumulative increase. Income quartile 4 (highest): Small fluctuations between 65.5 in 2005 and 56.5 in 2007, increased steadily from 67.4 in 2008 to 132.1 in 2014-101.8% cumulative increase. There was a consistent relationship between community-level income and the rates of opioid-related inpatient stays and ED visits from 2005 to 2014: the higher the income level, the lower the rate of opioid-related utilization. For each year over the 10-year period examined, the rates of opioid-related inpatient stays and ED visits were highest in the lowest income group and lowest in the highest income group (e.g., in 2014, inpatient stays: 296.8 vs. 157.8 per 100,000 population, respectively; ED visits: 231.9 vs. 132.1 per 100,000, respectively). The increase in the rate of opioid-related inpatient stays was similar across different levels of community income over the 10-year time period from 2005 to 2014. The rate of opioid-related inpatient stays increased between 61 and 74 percent across community-level income. From 2005 to 2014, the rate of opioid-related ED visits increased the most in communities with the lowest income. The rate of opioid-related ED visits increased the most among patients in communities with the lowest income (a 121 percent increase from 2005 to 2014). For all levels of community income, the rate of opioid-related ED visits increased faster than the rate of opioid-related inpatient stays over the 10-year period. Figures 5 and 6 show the community-level income quartile with the highest population rate of opioid-related inpatient stays (Figure 5) and ED visits (Figure 6) within each State in 2014. The income quartile with the highest rate overall is reported for each State. States where the difference between the highest and second highest rates was 10 percent or greater are noted with an asterisk. Figure 5 reports the community-level income quartile with the highest population rate of opioid-related inpatient stays for each of 44 States and the District of Columbia that provided data in 2014. Details on the income-specific inpatient rates are shown in Appendix A.
a Opioid-related inpatient rates are per 100,000 population. 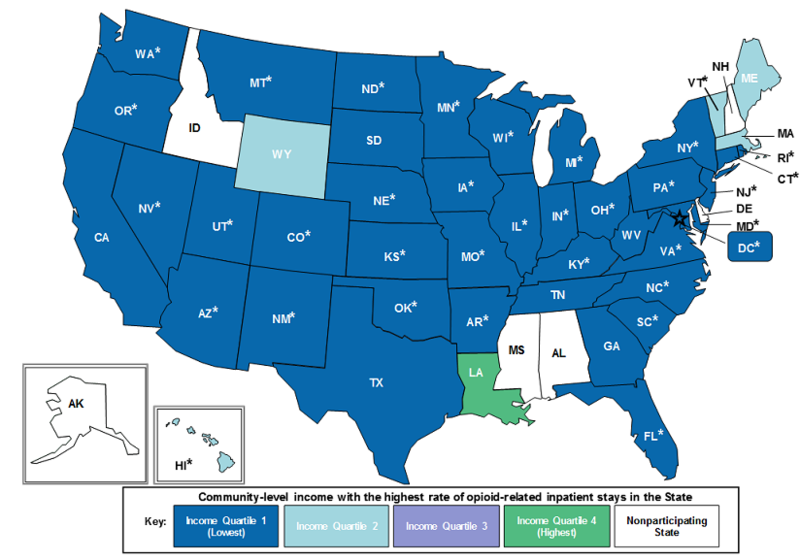 State-level inpatient rates by community-level income are provided in Appendix A.
Map of the United States that shows for each state the community-level income with the highest rate of opioid-related inpatient stays in 2014. Income quartile 1 (lowest): Washington, Oregon, California, Nevada, Montana, Utah, Arizona, Colorado, New Mexico, Texas, Oklahoma, Kansas, Nebraska, South Dakota, North Dakota, Minnesota, Iowa, Missouri, Arkansas, Wisconsin, Illinois, Michigan, Indiana, Kentucky, Tennessee, Ohio, West Virginia, Florida, Georgia, South Carolina, North Carolina, Virginia, District of Columbia, Maryland, Pennsylvania, New Jersey, New York, Connecticut, Rhode Island. Income quartile 2: Wyoming, Maine, Vermont, Massachusetts, Hawaii. Income quartile 3: none. Income quartile 4: Louisiana. For the vast majority of States, the 2014 opioid-related inpatient rate was highest among communities with the lowest income. Figure 6 reports the community-level income quartile with the highest population rate of opioid-related ED visits for each of 30 States that provided data in 2014. Details on the income-specific ED visit rates are shown in Appendix B.
a Opioid-related ED visit rates are per 100,000 population. 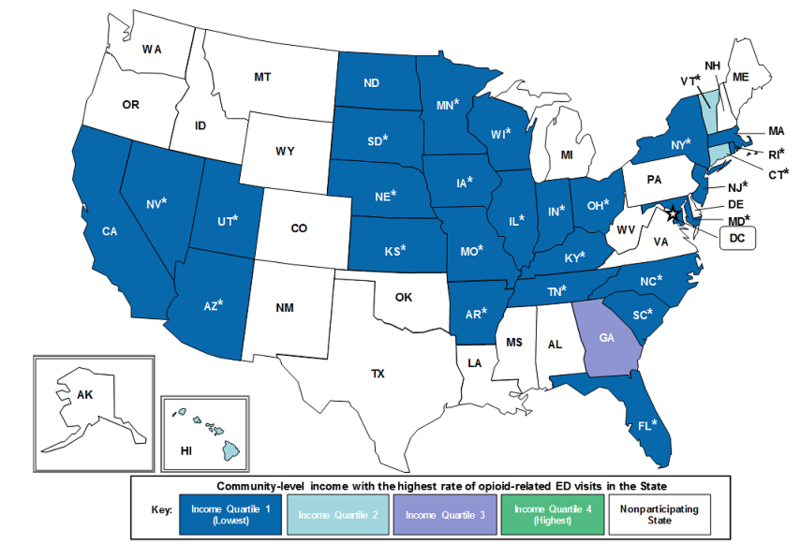 State-level ED visit rates by community-level income are provided in Appendix B.
Map of the United States that shows for each state the community-level income with the highest rate of opioid-related emergency department visits in 2014. Income quartile 1 (lowest): California, Nevada, Utah, Arizona, North Dakota, South Dakota, Nebraska, Kansas, Minnesota, Iowa, Missouri, Arkansas, Wisconsin, Illinois, Indiana, Ohio, Kentucky, Tennessee, Florida, South Carolina, North Carolina, Maryland, New Jersey, New York, Rhode Island, Massachusetts. Income quartile 2: Vermont, Connecticut, Hawaii. Income quartile 3: Georgia. Income quartile 4 (highest): none. For most States, the 2014 opioid-related ED visit rate was highest among the lowest income communities. Table 1 reports the relative rankings in rates of opioid-related inpatient stays for each of 44 States and the District of Columbia that provided data in 2014.
a The number of States represented in the top and bottom 25 percent of a specific patient subgroup were calculated on the basis of the total number of States with a rate available for that subgroup (i.e., excluding States for which a rate was not available). b Opioid-related inpatient rates are per 100,000 population. The actual inpatient rates for each patient location and income quartile by State are provided in Appendix A. Some States consistently ranked lowest or highest in rates of opioid-related inpatient stays in all patient location and income groups in 2014. Six States were consistently ranked as having among the lowest rates of opioid-related inpatient stays across all patient location and income groups: Iowa, Kansas, Nebraska, South Dakota, Texas, and Wyoming. Similarly, Arkansas and Georgia ranked among the States with the lowest rates in all but one location or income group. Three States consistently ranked as having among the highest rates of opioid-related inpatient stays across all patient location and income groups: Connecticut, Massachusetts, and Rhode Island. The District of Columbia, Maryland, and West Virginia ranked among the States with the highest rates in all but one location or income group. Some States ranked lowest for opioid-related inpatient stays for some patient location and income groups but highest for other patient location and income groups. Many States ranked highest or lowest for rates of opioid-related inpatient stays for select patient location and income groups, with some States having a mix of both the highest and lowest rates, depending on the group. For instance, California had among the lowest rates of opioid-related inpatient stays for patients living in large central and large fringe metropolitan areas but had among the highest rates for patients living in rural areas. Table 2 reports the relative rankings in rates of opioid-related ED visits for each of 30 States that provided data in 2014.
b Opioid-related ED visit rates are per 100,000 population. The actual ED visit rates for each patient location and income quartile by State are provided in Appendix B. Some States consistently ranked lowest or highest in rates of opioid-related ED visits in all patient location and income groups in 2014. Five States were consistently ranked as having among the lowest rates of opioid-related ED visits across all patient location and income groups: Arkansas, Iowa, Kansas, Nebraska, and South Dakota. Three States consistently ranked as having among the highest rates of opioid-related ED visits across all patient location and income groups: Massachusetts, Ohio, and Rhode Island. Maryland ranked among the States with the highest rates in all but one location or income group. Some States ranked lowest in rates of opioid-related ED visits for some patient location and income groups but highest for other patient location and income groups. Many States ranked highest or lowest for rates of opioid-related ED visits for select patient location and income groups, with some States having a mix of both the highest and lowest rates, depending on the group. For instance, North Carolina had among the lowest rates of opioid-related ED visits for patients living in large central metropolitan areas but had among the highest rates for patients living in rural areas. a Opioid-related inpatient rates are per 100,000 population. a Opioid-related ED visit rates are per 100,000 population. Inpatient statistics from HCUP Fast Stats were available for the following 44 individual States and the District of Columbia in 2014: Arizona, Arkansas, California, Colorado, Connecticut, District of Columbia, Florida, Georgia, Hawaii, Illinois, Indiana, Iowa, Kansas, Kentucky, Louisiana, Maine, Maryland, Massachusetts, Michigan, Minnesota, Missouri, Montana, Nebraska, Nevada, New Jersey, New Mexico, New York, North Carolina, North Dakota, Ohio, Oklahoma, Oregon, Pennsylvania, Rhode Island, South Carolina, South Dakota, Tennessee, Texas, Utah, Vermont, Virginia, Washington, West Virginia, Wisconsin, and Wyoming. Emergency department (ED) statistics from HCUP Fast Stats were available for the following 30 individual States in 2014: Arizona, Arkansas, California, Connecticut, Florida, Georgia, Hawaii, Illinois, Indiana, Iowa, Kansas, Kentucky, Maryland, Massachusetts, Minnesota, Missouri, Nebraska, Nevada, New Jersey, New York, North Carolina, North Dakota, Ohio, Rhode Island, South Carolina, South Dakota, Tennessee, Utah, Vermont, and Wisconsin. These codes include opioid-related use stemming from illicit opioids such as heroin, illegal use of prescription opioids, and the use of opioids as prescribed. Each type of opioid use is important for understanding and addressing the opioid epidemic in the United States.6 While there may be interest in examining how much each type of opioid use contributes to the overall opioid problem, many of the opioid-related codes under the ICD-9-CM clinical coding system do not allow heroin-related cases to be explicitly identified (e.g., in the 304.0x series, heroin is not distinguished from other opioids). In addition, the codes do not distinguish between illegal use of prescription drugs and their use as prescribed. The unit of analysis for inpatient data is the hospital discharge (i.e., the hospital stay), not a person or patient. This means that a person who is admitted to the hospital multiple times in 1 year will be counted each time as a separate discharge from the hospital. Inpatient stays include those for patients admitted through the emergency department (ED). Patients transferred between inpatient hospitals are counted only once. The unit of analysis for ED data is the ED visit, not a person or patient. This means that a person who is seen in the ED multiple times in 1 year will be counted each time as a separate visit in the ED. ED visits exclude those for patients admitted to the same hospital and also exclude patients transferred to another hospital. For this Statistical Brief, we collapsed the NCHS categories of Micropolitan and Noncore into a single Rural category. Community-level income is based on the median household income of the patient's ZIP Code of residence. Quartiles are defined so that the total U.S. population is evenly distributed. Cut-offs for the quartiles are determined annually using ZIP Code demographic data obtained from Claritas, a vendor that adds value to data from the U.S. Census Bureau.7 The value ranges for the income quartiles vary by year. The income quartile is missing for patients who are homeless or foreign. The new sampling strategy is expected to result in more precise estimates than those that resulted from the previous NIS design by reducing sampling error: for many estimates, confidence intervals under the new design are about half the length of confidence intervals under the previous design. The change in sample design for 2012 necessitates recomputation of prior years' NIS data to enable analyses of trends that use the same definitions of discharges and hospitals. HCUP Fast Stats (www.hcup-us.ahrq.gov/faststats/landing.jsp) is an interactive, online tool that provides easy access to the quarterly HCUP-based statistics for select State and national health information topics. HCUP Fast Stats uses side-by-side comparisons of visual statistical displays, trend figures, or simple tables to convey complex information at a glance. Topics currently available in HCUP Fast Stats include State Trends in Hospital Use by Payer; National Hospital Utilization and Costs; and Opioid-Related Hospital Use, National and State. HCUP Fast Stats presents statistics using data from HCUP's National (Nationwide) Inpatient Sample (NIS), the Nationwide Emergency Department Sample (NEDS), the State Inpatient Databases (SID), and the State Emergency Department Databases (SEDD). For other information on mental health and substance abuse, including opioids, refer to the HCUP Statistical Briefs located at www.hcup-us.ahrq.gov/reports/statbriefs/sb_mhsa.jsp. Agency for Healthcare Research and Quality. Overview of the National (Nationwide) Inpatient Sample (NIS). Healthcare Cost and Utilization Project (HCUP). Rockville, MD: Agency for Healthcare Research and Quality. Updated December 2016. www.hcup-us.ahrq.gov/nisoverview.jsp. Accessed January 31, 2017. Agency for Healthcare Research and Quality. Overview of the Nationwide Emergency Department Sample (NEDS). Healthcare Cost and Utilization Project (HCUP). Rockville, MD: Agency for Healthcare Research and Quality. Updated December 2016 www.hcup-us.ahrq.gov/nedsoverview.jsp. Accessed January 31, 2017. Agency for Healthcare Research and Quality. Overview of the State Inpatient Databases (SID). Healthcare Cost and Utilization Project (HCUP). Rockville, MD: Agency for Healthcare Research and Quality. Updated June 2016. www.hcup-us.ahrq.gov/sidoverview.jsp. Accessed January 31, 2017. Agency for Healthcare Research and Quality. Overview of the State Emergency Department Databases (SEDD). Healthcare Cost and Utilization Project (HCUP). Rockville, MD: Agency for Healthcare Research and Quality. Updated June 2016. www.hcup-us.ahrq.gov/seddoverview.jsp. Accessed January 31, 2017. Weiss AJ (IBM Watson Health), Bailey MK (IBM Watson Health), O'Malley L (IBM Watson Health), Barrett ML (M.L. Barrett, Inc.), Elixhauser A (AHRQ), Steiner CA (Institute for Health Research, Kaiser Permanente). Patient Residence Characteristics of Opioid-Related Inpatient Stays and Emergency Department Visits Nationally and by State, 2014. HCUP Statistical Brief #226. July 2017. Agency for Healthcare Research and Quality, Rockville, MD. www.hcup-us.ahrq.gov/reports/statbriefs/sb226-Patient-Residence-Opioid-Hospital-Stays-ED-Visits-by-State.pdf. The authors would like to acknowledge the contributions of Brian Eppert of Coding Leap, LLC, and Minya Sheng of IBM Watson Health. This Statistical Brief was posted online on July 25, 2017. 1 Weiss AJ, Elixhauser A, Barrett ML, Steiner CA, Bailey MK, O'Malley L. Opioid-Related Inpatient Stays and Emergency Department Visits by State, 2009-2014. HCUP Statistical Brief #219. December 2016. Agency for Healthcare Research and Quality, Rockville, MD. www.hcup-us.ahrq.gov/reports/statbriefs/sb219-Opioid-Hospital-Stays-ED-Visits-by-State.pdf. Accessed February 9, 2017. 2 Weiss AJ, Bailey MK, O'Malley L, Barrett ML, Elixhauser A, Steiner CA. Patient Characteristics of Opioid-Related Inpatient Stays and Emergency Department Visits Nationally and by State, 2014. HCUP Statistical Brief #224. June 2017. Agency for Healthcare Research and Quality, Rockville, MD. www.hcup-us.ahrq.gov/reports/statbriefs/sb224-Patient-Characteristics-Opioid-Hospital-Stays-ED-Visits-by-State.pdf. Accessed June 23, 2017. 3 Agency for Healthcare Research and Quality. HCUP Fast Stats Web site, Opioid-Related Hospital Use path. www.hcup-us.ahrq.gov/faststats/landing.jsp. Accessed March 6, 2017. 4 Agency for Healthcare Research and Quality. HCUP Fast Stats Web site, Opioid-Related Hospital Use path. www.hcup-us.ahrq.gov/faststats/landing.jsp. Accessed January 26, 2017. 5 Claritas. Claritas Demographic Profile. www.claritas.com. Accessed June 23, 2017. 6 Compton WM, Jones CM, Baldwin GT. Relationship between nonmedical prescription-opioid use and heroin use. The New England Journal of Medicine. 2016;374:154-63. 7 Claritas. Claritas Demographic Profile. www.claritas.com. Accessed June 23, 2017. Internet Citation: Statistical Brief #226. Healthcare Cost and Utilization Project (HCUP). July 2017. Agency for Healthcare Research and Quality, Rockville, MD. www.hcup-us.ahrq.gov/reports/statbriefs/sb226-Patient-Residence-Opioid-Hospital-Stays-ED-Visits-by-State.jsp.